One thing I always attempt to do with all my clothes is to make them as versatile as possible. Meaning translating summer pieces to fall (such as wearing nylons with shorts), fall pieces to winter (layering) and even winter pieces to spring (chunky sweaters over shorts/skirts). Sounds simple right? This maxi skirt has particularly been worn with cropped camis in the past but with Fall preluding, I figured pairing it with a tank and leather jacket would be a good way to disguise this once summer maxi skirt. I love this outfit, it can be worn casually or for work. The skirt falls so nicely! Thank you for the kind comments. love the maxi! you look so gorg! Lovely skirt and leather jacket. 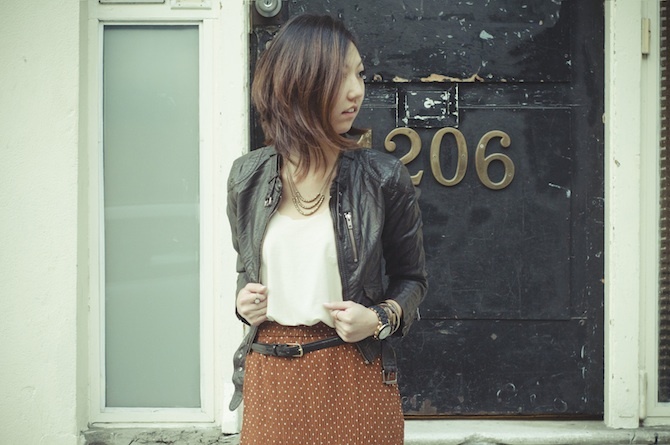 I absolutely adore the polka dot skirt with the leather jacket!!! FAB! New outfit post en el blog "MILITARY JEANS"
Thank you for your comment on my blog. i followied you some time ago ;)! Hey! Thank you so much for visiting my blog! :-* I am following you now everywhere! 😉 You can follow me back if you want…? P.S. This skirt is amazing!